Need a secure on-site solution for protecting valuable goods from theft or damage? 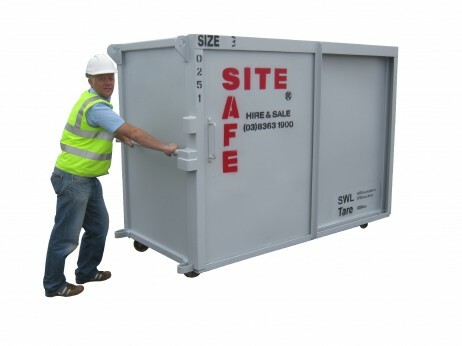 Site Safe is proud to offer hire of the A Safe – a mobile safe container that provides reliable protection of tools and equipment. Ideal for building sites as well as contractor industries, the Asafe is available in a range of sizes and is tough on thieves, making it a highly secure solution for builders, shopping centres, contractors and more. Boasting an external length of 1340mm, width of 700mm and height of 1785mm, the Size 2 A-safe has a generous storage capacity for various hand and power tools. Suitable for most construction sites and factories, this option features 3 fixed shelves and 8 hanging hooks. It also includes a 50mm hole in the floor that allows for convenient overnight charging of tools. Click here to learn more. With an external length of 2600mm, width of 1350mm and height of 1850mm, the Size 3 Asafe is the next step up for those who require more storage space. Featuring fixed shelves and hanging hooks, this size provides more space while still being able to fit through double doors. Click here for more information about the Size 3 A-safe. 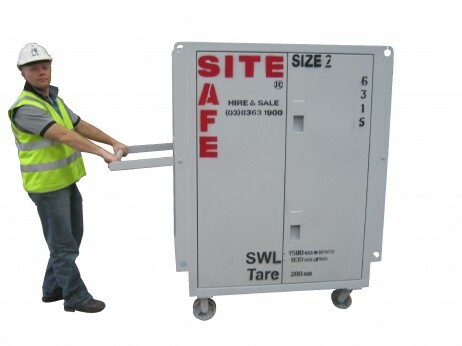 We also offer additional sizes of the Asafe. Click here to view all options currently available for hire in Victoria. To learn more about A Safe and how it can benefit your worksite, contact Site Safe today on (03) 8363 1900. We’ll provide you with more information and help you determine which size is right for your needs.